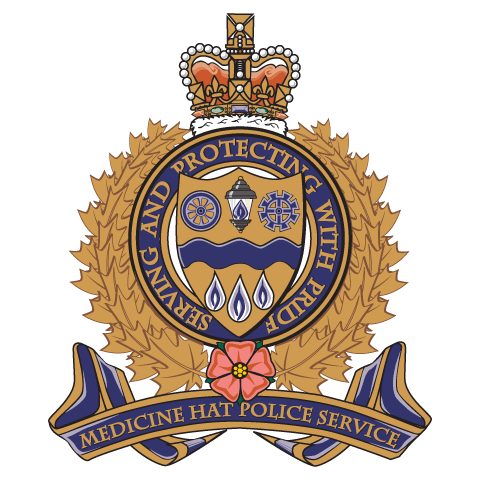 In 1994 the Medicine Hat Police Service conducted an internal audit of the programs and services it provided to the community, and identified that a need existed for a program of volunteers that would assist and support the members of the Medicine Hat Police Service. The first class graduated in 1994 and the Auxiliary Program has been a part of the Service ever since. Currently there are 8 active Auxiliary Officers. The Auxiliary program begins with the Recruitment Process which is identical to the regular Sworn Police Officer process. Once selected, Auxiliaries receive training in everything from policy and procedure to Officer Safety. Training generally takes place in the evenings and weekends and concludes with a graduation whereby the candidate is sworn in as a Community Peace Officer. Officers are then assigned to a Patrol Team with whom they assist with regular patrol duties, special events such as the Stampede and also have the opportunity to participate in yearly training. Each Auxiliary Officer is issued a uniform and duty belt. Although Auxiliaries are not armed with a firearm, they do carry O.C. spray, a police baton and handcuffs. They are also issued body armor. Auxiliary Officers are a valuable asset to the community and the Patrol Section and are at times exposed the same perils and situations as regular officers. The recruitment process follows the same requirements as a sworn police officer. To access recruiting information and forms, see the Recruiting Package for Inexperienced Applicants" found here. The Service encourages both those aspiring to a career in law enforcement and those simply wishing to serve the community to apply. Application Packages must be dropped off at the Medicine Hat Police Service no later than May 15th 2017. Attention to Sgt. Clarke White . Dates for subsequent steps in the process will be announced based on the volume of applicants. Applicants should be prepared to perform a fitness test in June 2017.